I was thinking of a new design for an absorber and couldn't find something similar, so I was hoping for some feedback. 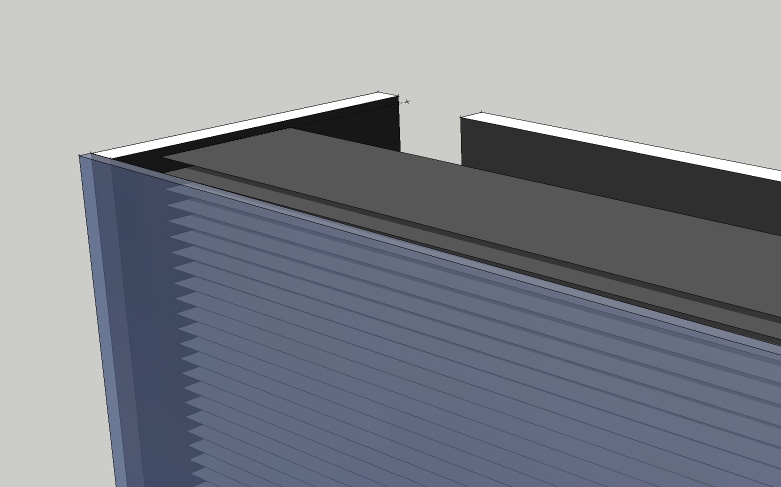 What I have in mind is a mix of the standard window screen collector design but with fins intead of a screen. Most finned absorbers I could find have in common, that they put the fins in an angle to the sun and to the airflow. I think it would be better to position the fins in direction with the sun as good as possible, so the light can penetrate deep into the absorber and gets trapped there. This should increase the energy absorbtion by a few percent. Also it souldn't be nessesary to position the fins against the airflow. For expample, if the absorber consists of 5cm high fins, placed 0,5cm apart, we have a absorber surface area of 10 times the collector area. The air in a 1,5m² collector would have to pass 15m² of absorber surface. This should be enough for good heat transfer and reduce the air resistence caused by redirection. The easiest way I can think of to archive this is by attaching strips of black painted aluminium foil to a frame. 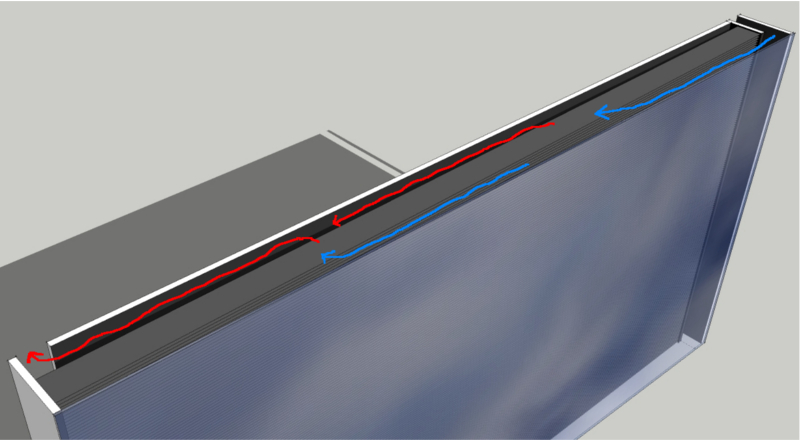 - To maximise the light penetration into the absorber, the fins have to be horizontal since the sun moves much more from east to west than up and down. So the airflow must go from side to side which could lead to problems due to the chimney effect. - If the aluminium foil starts to vibrate in the airflow, the material could workharden, resulting in teared strips. - Glossy paint on the Strips insteat of matte should reflect the light even deeper into the absorber. - Having a riffled backplate could decrease reflection of light, that isn't absorbed. - If there are problems with vibrations, a window screen directly behind the fins may help. The best hight of the fins and distance between them is also a big questionmark. With all other factors being equal, Angle of incidence is what determines the absorption rate. That is why pointing a collector at the sun works better then pointing it away from the sun, even know each receives the same amount of sunlight. You would need to work out the geometry to determine if the average angle of incidence over the length of a day is closer to 90°, vs the average angle incidence of a flat plate. Bear in mind that unless you invest in a tracker ($$$), your fins will only be at optimum once a day. Then there's cost. Screens are popular because they're cheap. It's passive, but you may find some info that will help. I don't think regular aluminum foil would last very long. Maybe the thicker Cinefoil that has been discussed here, but as mentioned making fins that way would be a lot of work for unknown effects on efficiency. Over a long distance the foil may expand and not stay parallel or there could be noise from the foil moving in the air flow. Fins 0.5cm apart sounds far too close. They will mainly be in shadow of each other. I have some fins on mine to increase the adsorption and create turbulence. They are widely spaced so the back plate gets the bulk of the energy.